The House of Representatives passed a bill last Thursday to amend the process used to determine whether a veteran receiving benefits from the Veterans Administration should be denied their gun rights. The Veterans Second Amendment Protection Act would change the process the VA uses to determine which of its beneficiaries are mentally incompetent in a way that disqualifies them from owning firearms. The bill would require a finding by a judge or other judicial authority that the veteran is a danger to himself or others before stripping his gun rights. The bill would roll back a regulation implemented by the VA under former President Barack Obama that required the agency to report individuals who use a representative payee to handle their financial affairs to the FBI's background check system and ban them from purchasing firearms. The rule resulted in hundreds of thousands of veterans being prohibited from owning firearms. Ninety-nine percent of the names in the FBI's database of "mentally defective" individuals were veterans reported by the VA as a result of the rule. Republicans criticized the regulation throughout the Obama administration as an infringement of veterans' due process and gun rights. Now that Republicans control every branch of the federal government, they aim to add due process protections they claim were missing from the Obama-era regulation. "I strongly believe we must do everything in our power to protect the rights guaranteed to all Americans, especially the men and women who have served, by the Constitution," said Rep. Phil Roe (R., Tenn.), the main sponsor of the legislation, in a statement. "The Veterans 2nd Amendment Protection Act does just that. I'm proud to stand with my colleagues in passing this important legislation that ensures no veteran who utilizes a fiduciary will lose their second amendment rights without due process." 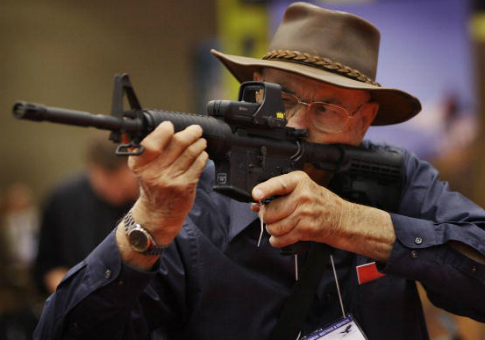 Gun rights groups praised the action as protecting the rights of veterans. "The constitutional rights of our veterans must be strongly protected," said Chris W. Cox, head of the National Rifle Association's lobbying arm. "The House vote today is a step forward in ensuring our veterans' rights are not infringed upon. Needing help managing your money does not make you a danger to society. "The NRA is pleased with the House vote today and we look forward to the Senate taking action soon." This entry was posted in Issues and tagged Guns, New Gun Laws. Bookmark the permalink.